Our post card exchange has now come to an end, sadly, but maybe we have something new in the pipeline. I sent Desiree horse sketches ..she and her family had horses at an earlier stage. Our two Comtois horses were my models and the sketch on the envelope I did from one of those sketches. For my postcard to Pat, I was in Vayrac, handing in all my old linen to be washed and went for a coffee. Afterwards I looked over the rooftops and realized I haven’t done such a postcard yet. So there. The rooftops of Vayrac for Pat. More experimenting with fall colors…which are quickly changing to grays and blacks and umbers. some of these experiments and playing with line and color simply turn out a mess…as can clearly be seen in “ochres and siennas”, but somehow I actually like this mess, since it is much more loose and spontaneous than the others, which are strict and too precise and stiff. the goal of this experimenting is, after all, not to render, but to interpret. In that sense, “ochres and siennas” are my best effort so far, the one I’m the happiest with. 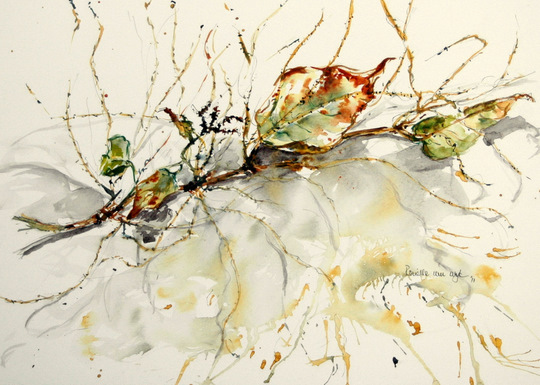 I used the messy sketch above to do a painting 0n larger scale and extra white abriano artistico paper. I shgould’ve gone for a more yellow tinted paper. Much lighter hand, lighter in color and more diverse in nuances…but still not what I’m after. A lot more work to do. But for this Sunday, it will do. I’m going for a walk in the woods now to find some grays. I’ve been neglecting my sketching and I can feel it clearly in my wrist. Stiff and uncomfortable. Unsure. Hesitant. 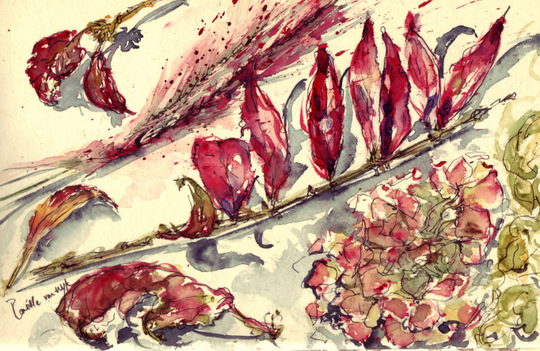 ..watercolor and pen in watercolor sketchbook, 15,5x25cm..
I’m back at Coin Perdu for a painting sabbatical. Only me, my art and my soul. I’m staying in the barn, made many changes and it is now more of an atelier than anything else. We surely won’t receive any visitors during winter, so I’m set with my easels and paints around a huge fireplace which burns day and night to provide me with heat. It is actually good to be a little on the cold side. It keeps my brain from being too comfortable and become lazy and my body needs to move and work constantly to keep my metabolism up. It helps with my neglected sketching, because my doodles are starting to turn into sketches. I will bounce back. I always do. 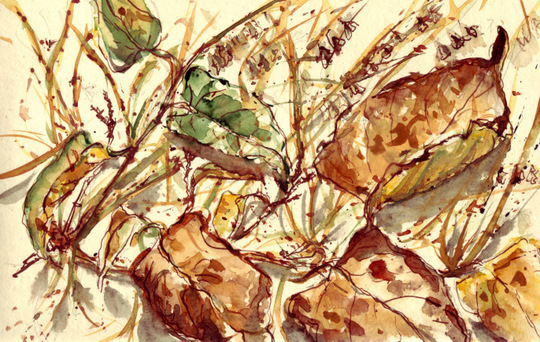 There is no better way to get back into sketching than using what is in abundance around us. Nature. and if it is too cold outside, we can even bring nature inside. Which is what I’ve done with the following three sketches. Going for walks and picking up. 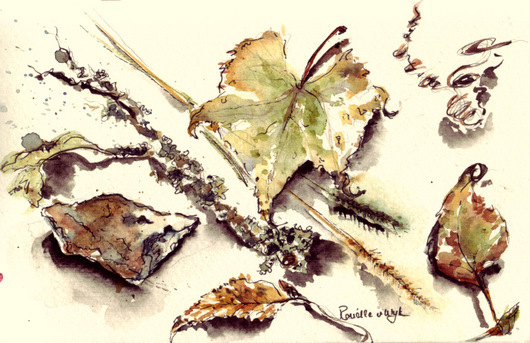 This will be my excercise for some time…trying to capture nature in its colors of Autumn and winter..with additions of whatever is moving and living during these months around Coin Perdu. Until next time…keep warm in the Northern hemisphere and enjoy the summers seasons elsewhere! The months are flying by rapidly and we’ve already sent off 6 postcards of 13, almost halfway through. 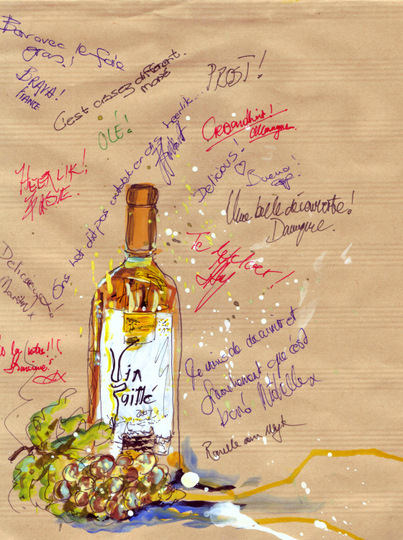 For this card to Martin, I decided on the vineyards here in Correze…our specialty wines, Vin paillé, meaning straw wine. 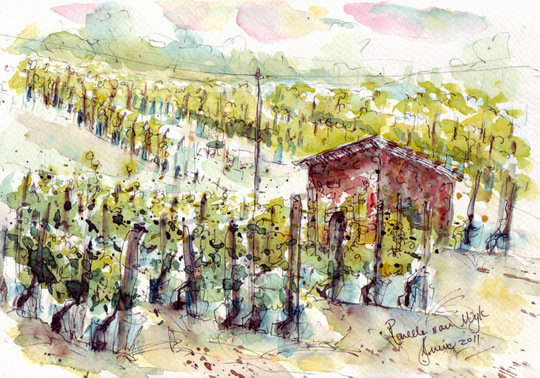 The grapes are semi dried on straw beds and then pressed. 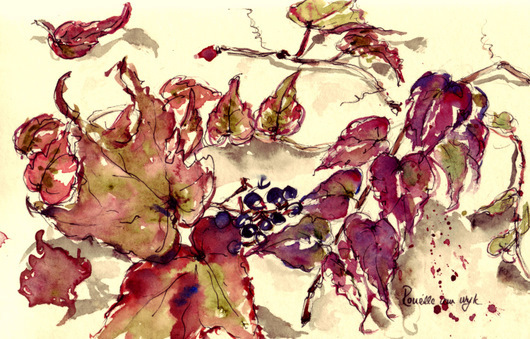 My postcard to Liz in Australia was a challenge and one I really enjoyed. Liz is an avid tea drinker and she is on a quest to try out all the different flavors on the market. 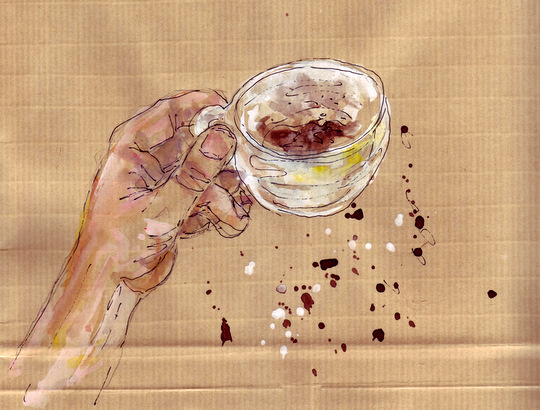 I’m not a tea drinker, but I can handle my coffee quite well. 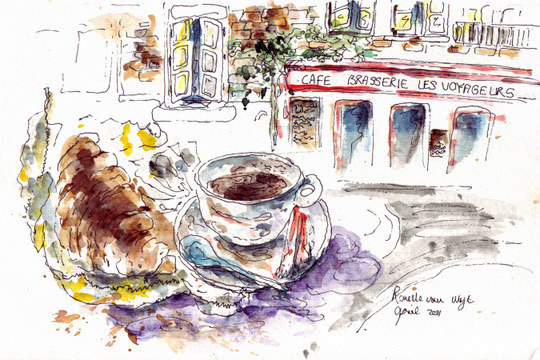 So the logical choice for a post card to Liz was of course…an early morning french coffee and a croissant! Pen and watercolor on watercolor paper. 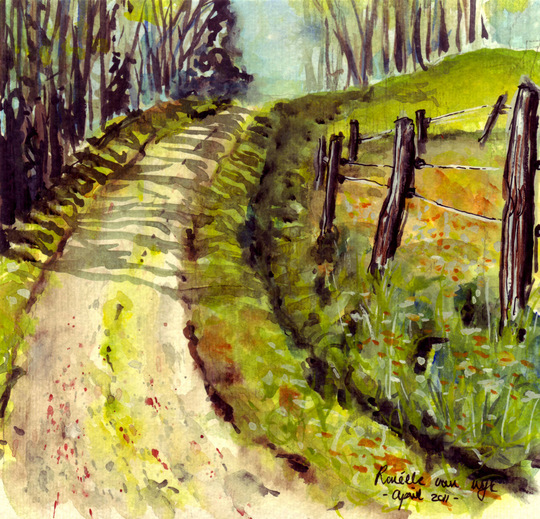 I decided on a “small road”, done in gouache for myApril postcard to Robyn. 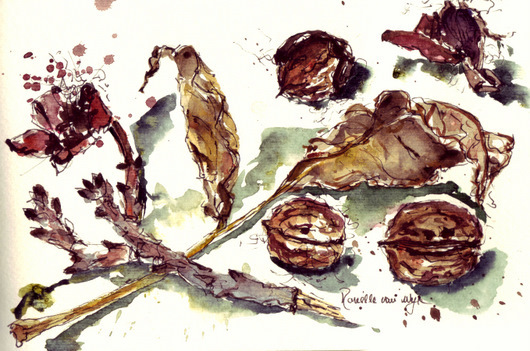 Starting with the envelope, I painted in gouche a quick sketch of what I would like to do on the postcard. gouache, ink and pencil on watercolor paper, 19x20cm. 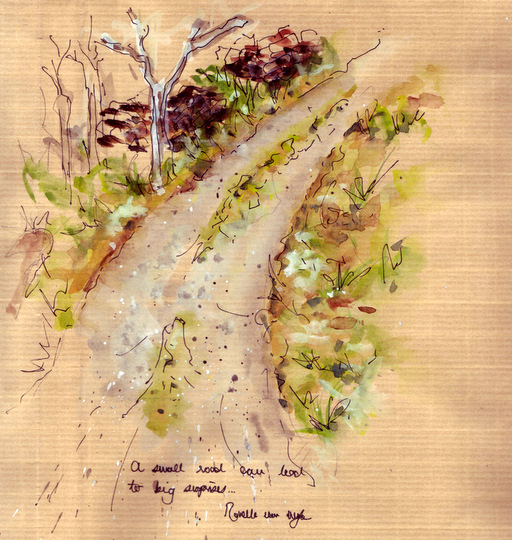 Fortunately, the little road leads up to our house at Coin Perdu and seeing it was close by, I could easily take my chair and goauche and try another one, which I found better, lighter. 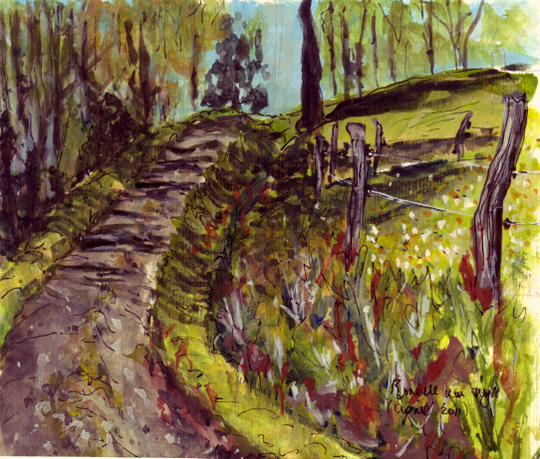 (painting 2). # Also have a look here at Vivien’s road in England, which she also did for a postcard, very different in atmosphere and beautiful! **And lastly.. I’ve been invited by Anna to take part in her series of interviews and it will be posted on her blog See. Be. Draw. on 28 April.